Disclaimer: The content in this blog is plagiarized from various sites and blogs and is considered as a place where all their views are consolidated and put into a view which can be used as a guideline for any web application development. All the articles from which this blog is based is given below in the “Reference” section. Thanks for all the great authors and their work. Truly Appreciate! Responsive Web Design (RWD) – The document does give more insights and details on this design as this most talked design consideration in regards to web application. Having different set of HTML and CSS catering to desktop and mobile device served by detecting the user agent and a single URL. Not considered to be a real way forward because of alternates (RWD). Two set of URL for desktop and mobile and is decided agent sniffing the user agent. Again, not considered as a choice because of alternates available and cons attached to it is high as opposed to pros. Having said that we can indeed have a mixed approach where we have a fixed width for large and medium screen widths and fluid widths for small ones. Whether small, medium or large, one site for every screen out there is the ultimate aim which RWD brings onto the table. Day by day number of devices, platforms and browsers are increasing and your application should be able to support as much as possible without breaking and without compromising user experience. At an onset, Twitter Bootstrap is the most promising one and once we do a full on paper evaluation to arrive at a choice. Historically, most web designers and their clients have approached the desktop side of any project first, while leaving the mobile part as a secondary goal that gets accomplished later. There’s a growing trend in the industry though to flip this workflow on its head and actually begin with mobile considerations and then work up to a larger desktop version. Mobile-First Responsive Web Design is a combination of philosophies/strategies, and ultimately boils down to a broader application of good old web best practices. As the digital landscape gets increasingly complex, we need to design experiences that work across the entire spectrum of digital devices.Mobile First is a philosophy created by Luke Wroblewski and as detailed above highlights the need to prioritize the mobile context when creating user experiences. Mobile isn’t a trend, nor is it even the future, it’s the present. o Almost 25% of the Web’s traffic now comes from mobile. If you didn’t build a responsive site, you’re already losing a quarter of your users. 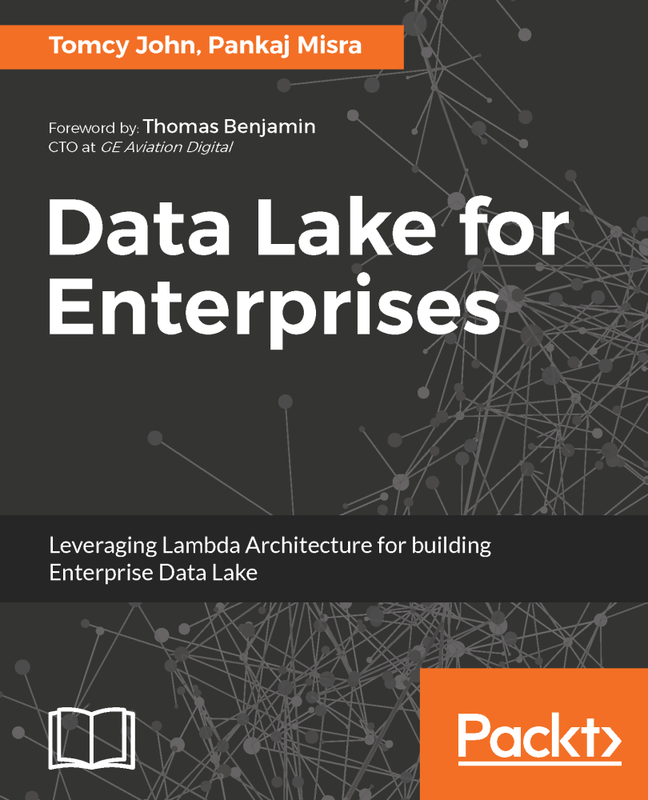 There are good amount of tools, technologies and framework available which will let you do this design principle easily. Announcement from Eric Schmidt in 2010 that Google was going to be taking this approach from now on. No problem going behind great leaders in this space. All the points as discussed in RWD holds good. It does put some constraints and pressure on the developer but its worth in long run and above all good for business. 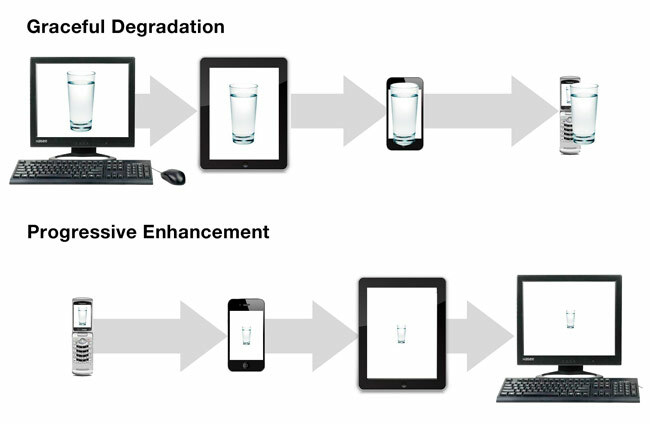 Mobile-first responsive web design comes down to using Progressive Enhancement and Graceful Degradation as a foundation for web strategy and design. Designing with progressive enhancement involves smartly adding layers of enhancements to a strong foundation in order to deliver an accessible and optimized experience to all. Starting with mobile and designing with progressive enhancement covers all bases (even if just at a rudimentary level). 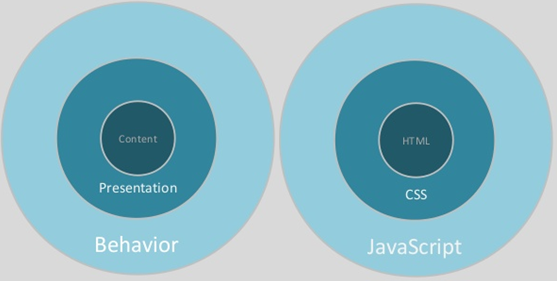 Note: Don’t misunderstand visualizing the above figure as almost equal to the RWD figure. Not only will the form factor changes when being used across multiple devices, the capabilities of browsers rendering these pages also have different capabilities. Figure 4 above explains Figure 3 in technical aspect clearly. You need to have a base HTML along with base CSS and JS which renders just fine in any browser (old ones). 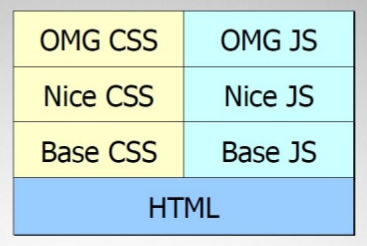 You need to have next set of nice CSS and JS which will adds more styles and behavior to the base one which works just fine in medium range browsers (IE 6, IE 8 etc.). You need to have awesome CSS and JS adding on top of base and nice CSS and JS, which will run just fine on all modern browsers (Chrome, Firefox etc.). Use detection libraries like Modernizr (http://modernizr.com/) to eliminate or rather adapt your web application to various HTML5 and CSS 3 capabilities each browser supports. For internet based web application having a definite mobile strategy, making the web application align with these design principles should be looked upon on a case to case matter as there is a cost involved in making a web application align with these design principles. Since there is a mobile strategy already existing for this web application, users does have an alternate way of accessing the application wither using a dedicated mobile URL or using a native app. Having said that, both mobile web URL and native app does have some dependency on the device being used and ideally considering the cost, going with our design principles and considerations as detailed above is encouraged. For internet based web application not having a definite mobile strategy, the application should be built using all the design principles and considerations as detailed above. The reason being, the application can be used by users in different parts of the world using different devices and browsers and the application should be ready to support this diversity. For intranet based web application having a definite mobile strategy, to not overburden the budget the design principles can be compromised but considerations should be taken into account and implemented. Ideally, if the application is responsive in nature even the mobile strategy of either having a dedicated URL for mobile or a native app can be reconsidered and can be taken out of service and replaced with the responsive site. For intranet based web application not having a definite mobile strategy, according to the usage patterns (analytics gathered from existing application or forecast and prediction on usage of mobile devices) the decision on whether to go with design principles has to be made. But, the considerations have to be taken into consideration and implemented. Note: Optimizing for every web-enabled device on earth is impossible, so eventually you need to make the strategic decision of what target devices and browsers for which the web application needs to be optimized. This decision can be based on existing applications analytics per market research on target web applications user base. Don’t try to make older browsers to do things they are never meant to do. If you do, you will have long development time, too many bugs and it will perform badly (slow pages). Set of Html’s and CSS (the URL remaining the same) catering to whether the user agent is desktop or a mobile device seems too much maintenance havoc and should be avoided and replaced with RWD.